Summer is in full swing, and the LTF team is out there enjoying it. Check out this fun postcard we received with some words of encouragement. Obviously this friend-of-the-theatre is getting their kicks in Paris. Can we open a fantastic renovated Lobero Theatre in December? Yes we Can-Can! The Lobero Theatre has been dark for one whole month now, and the Schipper Construction crew has been hard at work with demolition. Seats have been removed, the bricks outside the building have been carefully removed and stored for later use, and interior walls are coming down for the (hooray) expanded restrooms. Ever wondered how much space 680 seat cushions use when stacked? Turns out, they’ll fill an entire U-Haul truck. Check out peeks of original 1924 brick-work and other treasures hiding behind the drywall in these behind-the-scenes photos from June, shot by David Bazemore. Thanks to Noozhawk for coming down and speaking with key members of the Lobero Theatre Foundation Team. Read the full article here. The Lobero Theatre Foundation Board and Staff were saddened yesterday with the removal of an 89-year-old olive tree in order to complete the larger scope of the Encore: Lobero preservation work. Acting as stewards of the historic Lobero Theatre, the decision-making process included input from the city’s Building Department, Arborist, Historic Landmarks Commission, and the Pearl Chase Society. Encore: Lobero is a $7 million capital campaign undertaken by the Lobero Theatre Foundation Board of Directors for preservation and maintenance work including new seats, improved air flow, expanded restrooms, and ADA compliance upgrades to make the theatre viable for live performances for many years to come. The Lobero Theatre Foundation Board loves this theatre as much as our fans, and has spent time and resources researching alternative solutions over the last two years. The Lobero olive tree was infected with a fungus, Verticillium wilt, which has been deteriorating the tree from the inside out. Given its delicate condition and impressive size, boxing and removing the large tree would have been impossible without sustaining further damage. Similarly it was determined that the new site work required to meet accessibility requirements would irreversibly damage the roots. We are exploring the possibility of planting mature olive trees that are more resistant to the fungus in their place. Encore: Lobero continues 140-year tradition of the care and support of the Lobero Theatre from people in the community, including hundreds of donors and an all-volunteer Board of Directors. For more information, visit LovetheLobero.com. Lobero Theatre Gets an Encore! The Lobero Theatre Foundation is thrilled to announce that Encore: Lobero preservation work has begun at the Lobero Theatre. After two and a half years of fundraising, planning, expert review and permitting, the beloved Lobero theatre will now get some needed TLC. During the week of June 3, the Encore: Lobero preservation work officially kicks off with the removal of original entry bricks, which will be stored, protected and then reused on the reconstructed entry way. 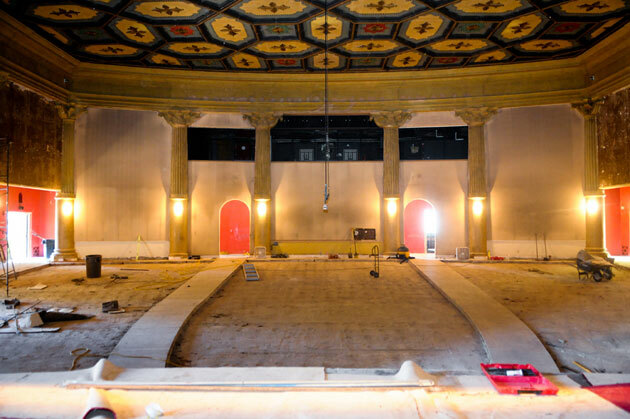 The scope of work over the next six months includes new seats, ceiling preservation, interior painting, improved air flow, expanded restrooms, ADA compliance upgrades and other elements to make the theatre viable for live performances for many years to come. For more information on Encore: Lobero, visit LovetheLobero.com.